Calling all ararchnophobes! Christopher Buddle, a biologist at McGill university, has dispelled some misonceptions in an article, “Spiders do not bite,” published on his site Arthropod Ecology. Well, actually, they do bite, but very rarely. And his article is limited to people living in Canada. The story is different in places like Australia! There are a lot of misconceptions about spiders. The most common is the idea that spiders frequently bite people – they do not. Most so-called spider bites are caused by something else. Spiders generally have no interest in biting us, and would rather feed upon invertebrates. I have been working with spiders for over 15 years, and I have handled many, many kinds of live spiders and I have never been attacked by a spider. Spider bites are often misdiagnosed, and caused by thinks like ants, bedbugs, and flies. Some of the spiders people identify as having bitten them don’t bite at all. Taxonomic error! But brown recluse bites are rare and, according to ABC news there has never been a single confirmed death in the U.S. caused by that spider. I have held many spiders and watched as they work away at trying to bite me, but they just can’t pull it off. Our skin is generally too tough for their little, wimpy fangs. As a graduate student at Harvard, I had a collection of live tarantulas from Central and South America, and I would handle them often and let them walk all over me. I was never bitten once, and they had fangs the size of cats’ claws. Most spiders are our friends, are biologically fascinating, and lovely to boot (take a look at these). Don’t fear them, but revere them. This entry was written by whyevolutionistrue and posted on August 19, 2013 at 10:36 am and filed under animal behavior, arthropods. Bookmark the permalink. Follow any comments here with the RSS feed for this post. Both comments and trackbacks are currently closed. I have severql spider strategically placed in the corners of my flat. They are excellent at nibbling away at the bugs. I don’t kill spiders on my apartment balcony and they kill a ton of bugs including mosquitoes. Mosquito repellant isn’t even necessary when sitting outside in the summer. Plus, I find them fascinating to watch. Very useful creatures to have around. I’m surprised that they are so effective at eliminating mosquitoes. Handy! I often kept spiders on our farm in middle Tennessee. Black Widow spiders were my favorite and kept them in big jars and put in extra baby eggs. They would eat the small spiders and live all summer. I let adults walk on my hands and arms. They never bit me. I think the more interesting question may be whether or not Canadians bite spiders…. Sorry, that information is classified on a need to know basis only! I’m Canadian and have never bitten, or been bitten by, a spider. Well, it’s never too late…. I’m in South Carolina, where the rain’s been historically heavy this spring & fall, which has apparently led to a great increase in spider activity everywhere, including in the thick woods where I run. So I’ve been hitting webs frequently, like sometimes dozens, in that mile-long leg of my course. It would freak me out, especially getting a whole web across my face. Almost made me want to run somewhere else until the colder weather returned. But I read an article on Yahoo a month or so ago very similar to what Christopher Buddle’s saying here. Probably also quoted him although I can’t remember now. Anyway, after I read it I said to myself what the hell, gotta keep doing the woods, just too beautiful, spiders or no. Still, I hate destroying them. Here in Arizona, we have black widows galore. I’ve never felt the need to run around at night and kill them the way most people do. I’ve never had my house sprayed for pests and I never get insects in the house. We do get the occasional bark scorpion but most of my neighbors seem to have more problems even though they use regular pest control. I’m convinced that the widows form a protective perimeter around the house and keep the insects (and scorpions) out of the house. Widows ar nocturnal and live outdoors so they are really not a threat to people. Yes, the Arizona black widow is bigger and more conspicuous than the eastern species. I rarely see one anymore, but they’re obviously nearby, since the flowering shrubs in our yard attract widow hawks (beautiful metallic blue wasps, similar to tarantula hawks but much smaller, that prey on black widows). If they do find a way indoors, my spider-eating cat nabs them. This is interesting. But some spiders do bite. I have been bitten twice. In my sense of morality I ‘deserved’ the first one (accidentally pinned the leg), but the 2nd one was for no reason that I could discern. That was when I was holding a very large wolf spider that I was holding in my open hand. Wham! It bit me. My first pet tarantula ‘Hilda’ tried to bite me several times but I was always able to brush her off before she could get her huge — really huge– fangs in. I have sent the whole post to Daughter of Hempenstein, an inveterate arachnophobe. I don’t expect it will do much good since she’s sadly as intransigent with her arachnophobia as creationists are with their Hypothetical Jesus. But, she also has a deep appreciation of things linguistic and poetic, so the quote may help more than any fact-based argument. I think the makers of the “Alien” movie deliberately used human fear of spiders to create fear of the Alien. Very effective I thought. IIRC, the monsters in the Alien movies were based more on parisitoid wasps like (ironically) the tarantula hawk. “There are no venomous spiders native to Canada.” A bit of a mistake here I am afraid as ALL spiders are venomous. Perhaps that was meant to be that there are no dangerously venomous spiders in Canada. But even that would be an error. The western black widow spider (Latrodectus hesperus) is found in southern Saskatchewan, Alberta and British Columbia. It is common in the Okanogan (southern British Columbia). This is a potentially dangerous species, although shouldn’t be considered “deadly”. It is certainly of medical importance. Should I ever visit Canada I would not be worried ~ I’m sure Canadian spiders are far too polite to bite without asking permission first. Arachnophobe here. It has nothing to do with fear of envenomation; it’s purely a discomfort reaction to….I dunno, all those legs or something. And knowing it’s irrational doesn’t make it go away; that takes training which I have so far not seen fit to subject myself to. Still, I don’t habitually kill them, just trap them and relocate them outside, where they’re more than welcome to chow down on garden bugs. All those legs that move too fast! Sometimes the eyes but mostly the legs and for some of them the fangs. I didn’t learn about the brown recluse until I moved to Louisiana, even though their range includes where I grew up in Alabama. My undergrad herpetology students would look at me horrified when I poked around in underbrush and ask, “Aren’t you afraid of the brown recluse?” So I looked it up…and immediately almost wished I hadn’t. But they’re easy to identify and not so hard to avoid (I use hooks in underbrush now anyway because of snakes in hiding), so I’m still okay with being friends with the more common nice spiders. Time and again I tell people that there aren’t any brown recluse spiders in this area (the Pacific Northwest) and what they think is a recluse is actually a harmless wolf spider. Although it could be a Hobo Spider. One time a few months ago, I was terrified that I’d been bitten by a brown recluse, but it turned out to be a caterpillar sting that I had a bad reaction to. Nasty little spiky buggers. They rain down from the live oaks down here in the spring. I hate those things. My neighborhood is full of live oaks and water oaks and we get them in droves. Wolf spiders and Dolomedes, which we here in the Great White North call “dock spiders”, seem to have strong enough fangs to bite. These ones scare me enough that I refuse to go where they are, namely docks up north. I appreciate spiders. I think it’s interesting that they have been around for a long time. They have an interesting past, however, I don’t feel the need for a personal relationship with any of them. I also never want to kill them (because it’s not the spider’s fault it’s legs freak me out), so I usually catch spiders that I think belong in the outdoors & toss them outside. The only spiders I leave indoors are the weird skinny legged ones that typically live in houses….those guys I always have to rescue out of the tub; I often pull them out & blow the wet off them until the water has stopped weighing them down enough for them to walk around. Spiders & I have a complicated relationship. damn apostrophe fail with “it’s”. However, I was definitely bitten once. I was sleeping on my back, at home, my head near an open (screened) window with my arms above my head, hands crossed just above my head. I was awoken by a powerful pain in in my arm the middle of the night (bees/wasps ruled out) slapped at the inside of my right upper arm (the surface that was facing up), pretty thin skinned, delicate tissue; and balled up a large spider under my hand. I examined the result and was definitely able to ID a spider (if not the species). This was in a very old house. I’ve been bitten or stung by just about every arthropod where I live (bees, hornets, wasps, ants, mosquitoes, flies, midges, gnats/blackflies/sandflies, fleas, leaf hoppers, leeches, ticks, etc.) This bite reacted like none I’ve every had before or since. It burned like a wicked flame for the first 1-2 days (really, seriosuly, distractingly painful), it formed a bright red welt about 3 inches (7.5 cm) in diameter, it then proceeded to itch like the dickens for a month before the skin had fully sloughed off. So I don’t normally react much to bites and stings and never have. I would certainly agree that psider bites are rare. But they happen. I once worked with someone who moved to Canada from Thailand. He had the choice between Canada & Australia and picked Canada because of his spider issues….keep in mind, he is from Thailand, where there are lots of spiders. We were talking about this and spiders in general once during lunch and he suddenly said, “Diana, can we just stop talking about spiders”. He was obviously holding in his discomfort and couldn’t take it anymore, but I just felt all cool because someone was more freaked out by the conversation than I! Are you masochistic enough to add this to your reading list? Move over, Spider-Man. 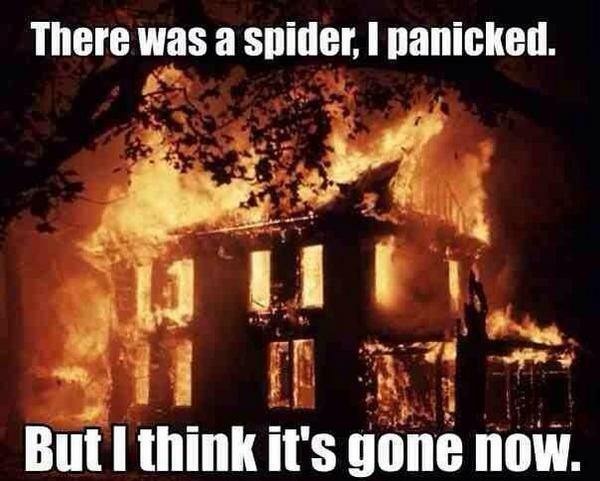 Arachnophobes, proceed at your own peril. Elias Pudd, the archfiend in Connolly’s masterful third suspense novel (following Every Dead Thing and Dark Hollow) finds such grizzly uses for spiders of all, er, stripes that he makes that dastardly villain Hannibal Lecter seem like Little Lord Fauntleroy. Pudd, however, is just one in a splendidly drawn cast that propels this gripping, intricately plotted tale. When a road crew in northern Maine accidentally unearths a grave site, the bodies turn out to be members of the Aroostook Baptists, a cultlike religious group whose members disappeared in the 1960s. Meanwhile, private investigator Charlie Parker (from the earlier novels) is hired to investigate the suspicious suicide of Grace Peltier, who was working on a graduate thesis concerning-guess what?-the Aroostook Baptists. Further muddying the waters is the Fellowship, a group led by the supremely unctuous Carter Paragon (nee Chester Quincy Deedes, “the name on his birth certificate and his criminal record”), which turns out to be far more sinister than anyone realized. From Connolly’s opening words-“This is a honeycomb world. It hides a hollow heart”-it’s clear that this is no ordinary thriller; indeed, his random musings on the manifestations of evil, coupled with Parker’s visions and flashbacks, lend the book a dark, intriguing overlay. Lest things become too intense, however, the author’s wry sense of humor easily lightens the situation, often harking back to earlier noir writers: “she had the kind of body that caused highway pileups after Sunday services.” In his novel’s acknowledgments, Connolly modestly writes, “As each novel progresses, the depths of my ignorance become more and more apparent.” Also becoming more apparent are the depths of this author’s psychological acumen, literary skills and prodigious creativity. There are many black widows outside our home and they never bother us. Scorpions, on the other hand, have stung me several times, all by accident. Unfortunately, our home has become very interesting to the Giant House Spider – Note the 2 troublesome words in that name – giant and house. I know that spiders are beneficial- I just prefer that they be beneficial outdoors. I do appreciate and marvel at spiders. But I know for a fact that some spiders have no love (or maybe too much love?) for human type vertebrates, and would just as soon eat you as any invertebrate. I offer the following rock solid, unimpeachable evidence. Once upon a time during my 15 year I awoke from my nights sleep and groggily shuffled and bumped my way towards the bathroom for my morning shower. I had only the vaguest sense of my surroundings and I was not really sure if I was awake or not. I stepped into the bathtub, pulled the shower curtain closed, stepped towards the faucet. As I did this I noticed a dark blob against the light shower curtain out of the corner of my eye. I thought nothing of it, it didn’t even really register at the moment it first impigned on my visual cortex. But then, as I was about to reach down and turn the water on, that amorphous blob in my extreme peripheral vision dropped down and . . . , I heard a distinct, and under the circumstances about to become evident, a disturbingly authoritative, thump. Behind me. I turned to look. Sitting there at the other end of the tub was a very stout spider that, including its leg span, was every bit as big as the palm of my hand. Then, it pivoted about 90 degrees until it was directly facing me. And then, it charged directly at me at full speed! I can only think of one other time in my life where I went so instantly from a state of near unconsciousness to such an extreme state of adrenalized fight or flight (or fright?) superchargedness. That other time involved an exploding power transformer 20 feet outside my bedroom window. I leaped straight out of the tub all the way across the bathroom, out through the door and into the hallway beyond, in a single bound. Bringing both the shower curtain and the curtain rod with me. One of the most difficult things I ever did in my life, besides living this episode down, was to make myself go back into the bathroom and look in the tub. With SVT making me feel ready to explode I carefully moved within peaking distance of the tub. As soon as that vicious killer screaming eight legged death beast from hell saw me it charged straight at me again!! It was so massive that it could not support its own weight on the vertical sides of the tub! It would charge across the flat of the tub, hit the vertical side, get 1/2 to 3/4 up on momentum and then slide back down. It charged straight at me like that repeatedly!! If you need any further evidence check out this excellent highly acclaimed documentary. Peaking? Peeking? Boy, what a mess. Not a mess. Bloody heart stopping & well written. What was it? You can’t finish the story like that ~ what did you do about monster spider? Ahh crap! I was hoping I wouldn’t have to confess this but, the poor spider did not survive this encounter. All I can say is that I was young. The spider was without doubt a Huntsman spider, though I didn’t know that then. It was really a magnificent creature and I regret that I killed it out of fear. All these decades later my family still sometimes laughs at me about that incident. A similar experience from Britain … with tragic outcome. It would frighten even Superman or Garth! Of the Spider sitting glowering in the bath. Certain Old World Tarantulas (popular sense of name) are quite ill-tempered and will charge. I should perhaps mention it was one of the large ones — or at least as large as they get in Sweden: a couple of centimetres across. But honestly, that’s more than enough! Canadians gets bitten by everything. I once bit a Canadian. Very disappointing. My freshman year in college, my mother was bitten by a brown recluse. We live in Oklahoma where they abound; a neighbors apartment complex is riddled with heir signature messy-as-hell webs. Anyway, it’s been 5 years since my mom was bitten, and can’t quite remember if she failed to diagnose he bite early (most likely) or it just got real bad real quick, but in a wound no bigger in diameter than a quarter, she was able to stuff nearly a yard of gauze (the bite was just above her ankle). She sent me pics that I kinda wish I’d saved now! I think the rest of us are very thankful that you didn’t! This seems either misleading or wrong. It’s not that spiders can’t bite, but that they don’t bite except very rarely. And on those rare occasions, the bite almost always has only trivial effects on the human, who after all weighs from a million to several million times as much as the spider! Rod has compiled a great and popular website for debunking myths about spiders. It’s fascinating! That struck me as wrong as well, given that spider fangs are hard (keratinized), sharp little hypodermics. At the extreme end, I understand the larger tarantulas of the Americas can pierce fingernails with their chelicerae. I’ve been bitten twice by brown recluse spiders. Painful, red bumps that blister, then decay, leaving a hole in your skin and underlying tissue. I killed both spiders and ID’d them for future reference. Some people can become very ill from their bites. What’s odd is that they are not usually found in MN. Maybe climate change is forcing them northward? I live in New Zealand, and was bitten by a wolf spider which not only got inside my house, but got inside my underpants… Some unsympathetic people might say it was my own fault, since I had hung them up on the floor the night before. Warning, some graphic content follows. So I quickly squeezed the cloth together in the affected area to trap and pulp the attacking arthropod – my usual panicked approach when i suspect something like that has got inside my clothes. I then shook the remains out and could identify brown wolf spider legs in the balled-up ramains. I anxiously checked for any swelling or fever over the next few hours, but suffered no ill-effects. Well here in Australia the situation is slightly different, but not a lot really. We do have some really venomous spiders – most notably the Funnel Web, but it’s range is relatively limited. But it is quite an aggressive spider, and deaths in humans do occur, albeit infrequently. There are others which are dangerous to humans, but I don’t think there have been any deaths from other species. We also have black widow spiders – although we call them Redbacks. They were probably introduced from the USA, but they are really wimpy and absolutely nothing to worry about. Perhaps the most common big spider that people encounter regularly is the Huntsman. They grow huge, and are commonly seen in people’s houses. They can inflict a painful bite, but I usually pick them up to put them outside and have never been bitten. There have apparently been at least 14 deaths recorded from redback spider bites in Oz. And what makes you think that redbacks are not native to Australia? I have never heard that suggested before. Here in Oz we are also wary of white-tailed spiders, whose bites were long said to cause necrotic ulcers, though a study by Isbister and Gray (2003) apparently suggests that they don’t. Members of my family have been bitten by redbacks on various occasions, followed by hanging around the local emergency department for monitoring but with no serious consequences. Members of this group are easily transported in cargo containers, but experts can tell them apart; different sources I read in the ’70s were treating the redback as a species Latrodectus hasseltii or a subspecies of L. mactans, but now many distinct species are recognised in the group (e.g. 32 listed here). Recent DNA papers find the New Zealand L. katipo is very close to the Australian form, , but I haven’t seen a molecular phylogeny & biogeography study on a global scale. I’ve never had a spider bite, because I’m so careful with them that some people find it funny; it’s harder to maintain the proper distance from the sharp bits than it is with snakes. One time in my teens I was so careful, while collecting Sydney funnelwebs in a jam jar whose lid I’d neglected to bring with me, that when the large female appeared on the back of my hand I didn’t even hear where the jar came down. Or either of the spiders. That was some flinch. Actually I’m more creeped out by crickets, some of which have huge razor-sharp mandibles (Australia has many members of the same group as New Zealand’s monstrous weta). One sliced through the webbing at the base of my thumb once, and my body has not forgotten it. I think your information about redbacks is kind of dangerously misleading. Their venom is neurotoxic in humans, and highly variable in effect. About 2000 Australians are bitten each year. Most of them will only experience strong localised pain and swelling, which can be treated with local application of an ice pack. But the bite victim should be under close medical supervision for at least six hours after the bite, as in up to 20% of cases serious, and some times potentially fatal, further symptoms can occur. Usually uncontrolled sweating, muscular weakness, nausea and vomiting. In severe cases victims experience tachycardia, hypertension, spasms, paralysis, and even temporary psychosis. These will require further treatment. Over 250 cases a year require treatment with antivenom. We do have a safe and effective antivenom, and to the best of my knowledge no one has died from redback bite since it became generally available back in 1956. One death from redback bite that I remember reading about was of a seven year old boy, back in 1953. This despite rapid medical attention and hospitalisation. Elapsed time from bite to death was about one and a half hours. This one lodged in my memory as it was so fast. Redbacks are no longer considered a sub-species of black widows, as they are genetically distinct. The first record of the species is from South Australia, only 14 years after colonisation. Seems their numbers and range have been increasing ever since, as we’ve made all these nice garages and junk heaps for them to live in. In England we’d call out for a cup to capture/release an errant spider. Moving to Australia we had to change to “bring an icecream container & yard brush” to corral the bigger beasties here. BTW “root” as verb/noun has quite a different meaning down here. You may surprise your host with suggesting a quick root in the undergrowth! During college I had a summer job cleaning a dormitory near a river in Wisconsin. Every morning we had to vacuum up these spiders that looked like marbles with legs. The first time I had to do it, it took forever for me to get up the nerve to kill something but by the end of the summer I had no compunctions. …then the next summer I lived in a boarding house with a bat infestation. Interesting ecosystem Wisconsin has! Agree, water bugs are the worst! Good for this arachnophile to see a positive article on spiders, and some positive feedback as well. Spiders: Learning to Love Them by Lynne Kelly. Set in Australia, so mostly about Australian spiders, but widely applicable nevertheless. I was tilling up a small patch in the garden to plant some late cabbage, and spooked a wolf spider with an abdomen covered in her tiny offspring. I nudged her a bunch of times to make sure she got clear of the area to be tilled. One of the cabbage plants had a caterpillar nomming it, which I removed. It dangled from my hand with a silk thread, which told me exactly what to do. I went over to where I left the wolf spider, found she was still there, then dropped the caterpillar onto the ground right in front of her. She bit it quickly, and it stopped moving. When I looked at the spot a short time later, I found no spider and no caterpillar. So my guess is that she took her unexpected prize and moved off, perhaps to let her children dine on it. There’s only one place around here where spiders aren’t welcome – under my covers crawling on my leg. This website seems to be largely atheist, and with a high level of interest in the natural world by observation. Just a little more evidence for the idea that religion leads to an impaired sense of reality and a distrust in personal observation. In Rarotonga, we used to get lovely big hairy spiders maybe a couple of inches across (OK, not really big by tarantula standards, but still satisfyingly chunky) that used to hang around the house. I used to quite like them, I regarded them as a sort of pet. One day I was pursuing a cockroach (oh yes, we got big cockroaches too, but I didn’t regard them as pets) and it ran into the end of a rolled-up mat, I gave a concentrated blast of bugspray after it, and then to my horror our beautiful big pet spider staggered out. I felt like a murderer. But much to my relief, a couple of days later, our spider was rumbling around the place apparently fully recovered. I don’t have arachnophobia, it’s centipedes that give me the creeps, all those squirmy wriggly legs and they reputedly have quite a nasty bite. Apropos of which, James Bond fans will recall the sequence in the Dr No movie where someone put a tarantula in Bond’s bed and it slowly crawled up him under the sheets. But true Bond aficionados will know that in the original book, it was a big centipede, which Fleming described in chilling detail – way, way more creepy. Warning: these macro shots are at greater than life size. They are not for the arachnophobic. Both species are largely harmless to humans. (Hope I didn’t wreck the links). A student of mine (now a Penn State professor) was bitten by a brown recluse on the morning of graduation (the spider was in some clothing in his closet and he put it on whereupon he was bitten in his side). He didn’t want to interrupt the graduation with a trip to the doctor, so he didn’t do anything about it for a day. Consequently he now has a quarter-sized divot in his side – as the doctor put it, the toxin imparted by the spider has an effect much like a local case of leprosy. First, THANKS to WEIT for posting this article – I have received as much negative as positive feedback from my original post, in part because people called me on being ‘extreme’. Yes, of course spiders do bite, BUT the case I made is that spider bites are exceedingly rare – which is true. I was being extreme on purpose – the purpose being to drive people to read my article and hopefully to dispel some myths. This WEIT post is furthering this cause, and (again) thanks! The other big issue is that despite rationale thought and argumentation, many people just don’t “believe” that the vast majority of spiders are completely harmless to humans. Arachnophobia is so common in North American society, and from a young age, arachnids are often depicted as scary, harmful and creepy. This is a real shame as these animals are among the most fascinating of all. I like spiders too. I’ve noticed that my niece and nephew both liked spiders when they were 2 or 3, but now they’re a bit older they’re scared of them. I assume this is something they learned from their mother, who is terrified of spiders. Either way, it’s a shame. You are incorrect in stating that there are no venomous spiders native to Canada. The northern Widow, close relative of the Black Widow, l.mactans, is present in fair numbers in Southern Ontario, especially the extreme Southwest part of Ontario, around Windsor. Look up the Ojibway Prarie Complex on the net. There is also a widow species native to the southern areas of western Canada.